Elsie Henderson was a sculptor, painter and lithographer, and is most well known for her depictions of animals which she produced with an impressive fluidity of line. She was born in Eastbourne, Sussex, but spent much of her childhood in Guernsey attending the Girl's School. 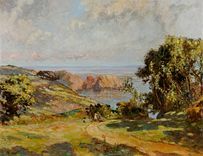 In 1903 Henderson went to the Slade School of Fine Art, London, where she was taught by Fred Brown, Henry Tonks and Wilson Steer. At that time the Slade was dominated by a group calling themselves the New English Art Club, of which Brown, Tonks and Steer were also members. Consequently many pupils at that time were heavily influenced by the NEAC. The NEAC had formed as a reaction against the Royal Academy and was influenced very much by the French Impressionist movement. One of the major figures of the Group was Walter Sickert whose impressionist style captured subtleties of light and tone combined with an often melancholic palette. 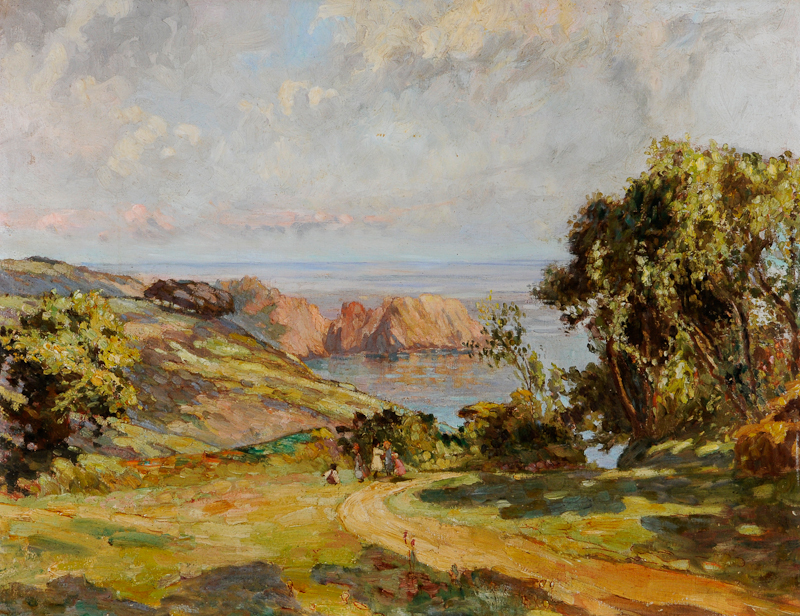 Henderson's 'Peastacks and Moulin Huet' betrays the influence of both her teacher Wilson Steer as well as Sickert, with its muted palette and vigorous brushwork, capturing fleeting light and shade.